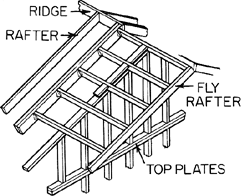 A rafter in the projecting portion of a gabled roof. screws from the backside of the sheathing after you slip them into the precut notches you cut in the fly rafter. Shortly after the final organisers were providing a helicopter to fly Rafter and Escude to London for Wimbledon. Shortly after the final, organisers were providing a helicopter to fly Rafter and Escude to London for Wimbledon.